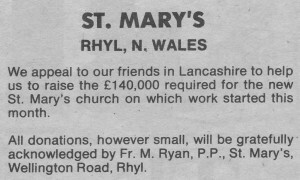 The Mission of Our Lady at Rhyl was founded from the Jesuit College of St Beuno at Tremeirchion in 1851 by Fr J. Etheridge, rector of the college. 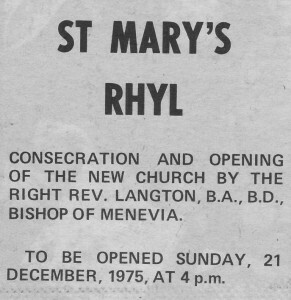 At this time there were very few Catholic families in the new town of Rhyl. 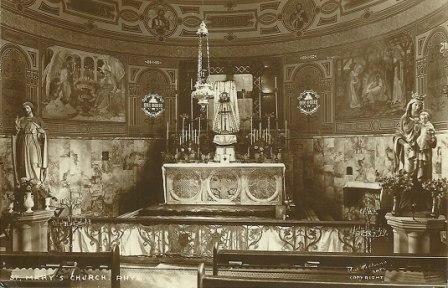 The first mass was celebrated in the parlour of a public house known as ‘Costigans Railway Tea Rooms’. 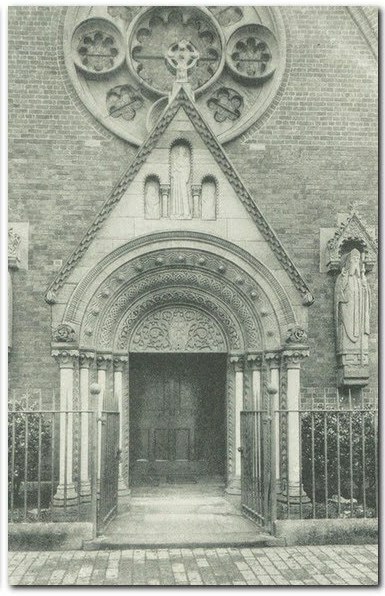 Within a short time, the Town Assembly Rooms in High Street (now occupied by the Job Centre) were rented by the Catholic population to serve as Church and School. 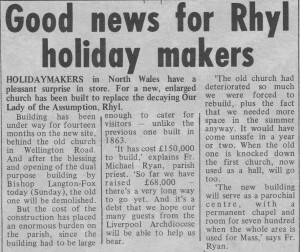 By 1854, a piece of land on Ffynnongroew Road had been purchased, on which a chapel was built to accommodate around 150 people. By 1861 it was decided that a large Church was required. 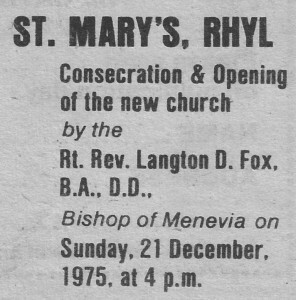 A final decision was made on Christmas Eve 1862 to build this new church on land on the corner of Wellington Road and Ffynnongroew Road and work on the foundations commenced on 1st January 1863. The inscription on the foundation stone read: ‘The foundation stone of this Church, built in honour of The Assumption of Our Blessed Lady, was laid by His Lordship the Right Rev. James Brown, Bishop of Shrewsbury on Tuesday 3rd March, 1863.” When the work was completed, it gave us a large church and our own school, formerly the Mission Chapel, alongside. On Tuesday December 8th, the Feast of Our Lady’s Immaculate Conception, the new church was solemnly blessed and the High Altar consecrated. The church, designed to convey the idea of an ark, was entered through a richly carved porch with three statues in sunken niches representing the Assumption of Our Lady supported by angels. The stained glass wheel window above the entrance also represented the Assumption. This window, designed by the architect of the church, John Hungerford Pollen Senior showed the Virgin Mary in a blue robe surrounded with rays of light and stars in the centre, with other outside roundels depicting angels with their hands clasped in devotion. The wheel window, like the church, was of architectural interest, and is now housed in the Stained Glass Museum inside Ely Cathedral. The roof was designed to portray the gathering in of souls by gigantic pastoral crooks and on either side and above the High Altar were beautiful hand-painted murals by an unknown Italian artist. After nearly one hundred years of worship, St Mary’s Church building was becoming a safety concern. The choir balcony was separating from the main wall and the bell tower had become unsafe. 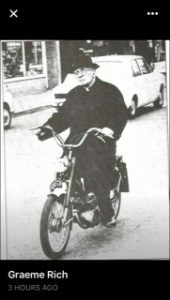 Under the Parish Priest at that time, Canon Patrick Collins, fund raising activities began for a new multi-purpose church, with the main unit comprising of the church housing the Blessed Sacrament, and an additional three units forming a square. These were intended for seperate activities, or the building could be opened up into a large area to be used as a large church holding approximately 1,000 people. Building work started in 1973. 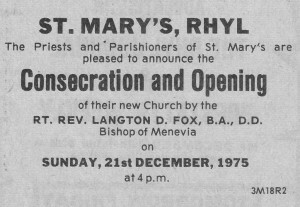 On Sunday 21st December at 12 noon the final Mass at the old St Mary’s Church took place, whilst the new St Mary’s was consecrated and opened the same day at 4pm. Various parts of the old church were transferred into the new church. The centre front altar stone formed the main front of the new altar, and the marble was also used in the Lectern, Baptismal Font and Easter Candle base. The stained glass window was preserved in the Stained Glass Museum at Ely, whilst Canon Collins gave the bell to the newly opened Catholic Church at Gellilydan in Blaenau Ffestiniog.